Sorting is usually applied to a long list of items in which items have multiple characteristics. The user can acces the sort option through the main menu. … and a dialog containing the available sort-keys is shown. …and the list is rearranged according to the chosen key. 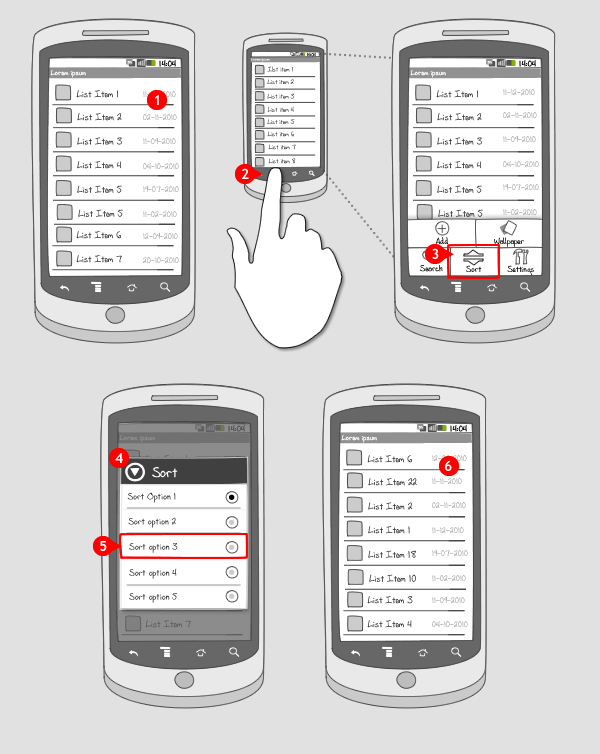 Sorting is applicable when your app displays many items and the items have multiple characteristics (e.g. name, size and date). Users need to scan for the characteristics interesting to them, or need to compare items on one particular characteristic. 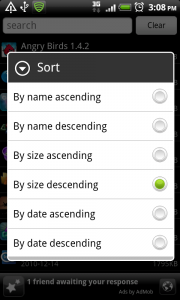 For that, rearranging the list using a sorting option can be used. Ideally, every characteristic is a sort-key, but offer at least two keys. If you want the user to be able to make their own rearrangement, independent of sort-keys, consider using drag&drop sorting. With sorting, the entire set of items stays visible to the user. If you want to show only a specific category or group of items relevant to the users choice, consider using filter options. All items remain visible, to view the desired item scrolling might still be needed.